I got my festive swap package from lauren today. 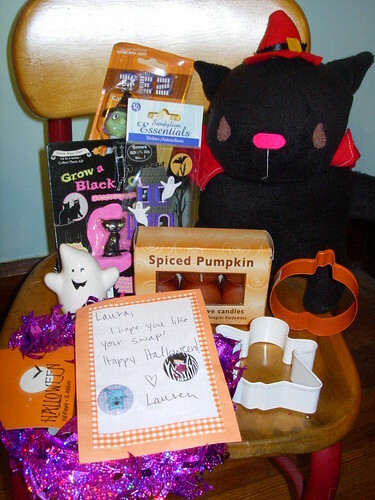 it's full of Halloween goodies, including a handmade softie cat. I'm pretty sure my dog would looove to get ahold of this and keep it all for himself. It doesn't have a squeaker in it, though, so it's safe. I also got some pumpkin candles, which are perfect b/c I ruined the candles in my bathroom a few weeks ago. I forgot they were burning, and the wax overflowed all over the floor!